Designed to replace the traditional notepad and pen, and as an alternative to expensive handheld mobile data terminals (MDT) that cost typically over £1000 each, our solution is designed to run on affordable existing and commonly used web enabled mobile phones or tablets like the iPhone, iPad, or budget Android alternatives at a fraction of the cost of the industry standard device. Trackitnow offer a wide range of connected services all designed in-house and from the ground up. Trackitnow can connect with clients existing back office system and databases. 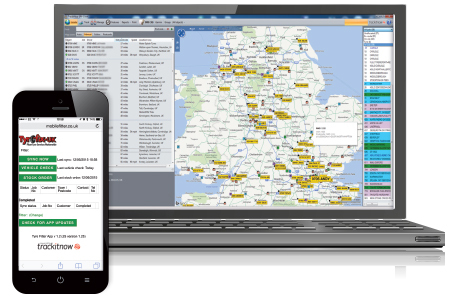 Trackitnow have developed a unique mobile workforce solution for clients who don't have existing back end systems that offer all the benefits of job scheduling and POD (proof of delivery) signature capture for a fraction of the cost of a bespoke developed solution. The features below are available to users of the standard ERA Client Software for a additional monthly fee. The bespoke version contains all of the features of the standard version but it can also be customised to your requirements. This version will tie in to your backend servers to provide a seamless and paperless workflow management and communication tool. The system works with manufacturers such as Apple, Samsung, LG, Nexus, Nokia and many more as well as lesser well knows rugged alternatives like the dual sim card compatible CAT phone. Available as either as a stand-alone system or for your added convenience, built in to the Trackitnow ERA tracking software, the system is easy to use, fully backed up and can even be tied in to your existing back office call-logging system to take a job or task from initial customer enquiry or request to completed invoice. The systems can include full stock and audit control and daily vehicle inspections. Exception reporting allows a fleet manager to monitor vehicle/driver safety and compliance. Trackitnow host a wide range of `middleware` connectivity platforms to ensure the tablets stay live, even if your own systems fail, keeping your mobile workforce productive and earning money. This is a very broad subject and we would need to discuss your specific requirements. Please contact us to discuss. The features below are available to users of the standard ERA Client Software for a additional monthly fee. For additional functionalitty, please see our bespoke version.